Taking a 40 Hour Sabbatical is simple. 2016 has been a long year, a really long year filled with life changes and personal challenges that had me yearning for a long run, a really long run! The plan for my #40HourSabbatical was to run across the state of Florida, starting on December 10 with my feet in the Atlantic Ocean and to finish on December 15 with my feet in the Gulf of Mexico. Over those six days, I would run around 130 miles and breathe in the fresh air, enjoy being outside, take whatever the day gave me, keep things simple and learn to take life one step at a time. 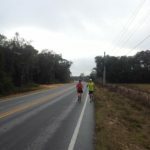 I planned to stop in some authentic Florida towns like Umatilla, Deland, Weirsdale, Ocala and Dunnellon, and stay in some cool motels with names like the Dinner Bell Motel, the Shamrock Inn and the Fox Den Inn. I learned just how relaxing life can be when you step away from the chaos. I learned that "my" world doesn't fall apart just because I'm not there to deal with it 24/7. I learned that my body is incredibly resilient and so is my spirit. I learned that perhaps the only thing that I have to do in order to accomplish a big goal is to say I'm going to do it. 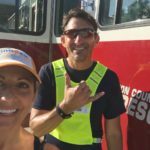 I learned that even though my run across the state seemed like an individual effort, it was anything but. I thought I could do it all on my own, but I couldn't. 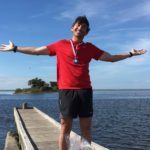 I was humbled by the support offered to me and the people who selflessly helped me along the way, toting dirty running gear in their cars or running long hot miles with me on the road...or protecting me from rabid dogs (Thanks Charlene!). I learned that my family and friends are the true source of my strength, and I am so much better of a person because of the people who I am surrounded by. I cleared my head and revitalized my spirit. I wore out a couple pairs of shoes and learned the importance of taking the time to take care of my body....every single day. I realized how that, in middle age, I am so thankful to have my health and to have maintained my fitness because it allows me to have wonderful and meaningful adventures. I finished my run across the state feeling better physically and happier than any endurance race i've ever finished. This adventure exceeded my expectations. I feel revived physically, mentally, emotionally and spiritually. Mark Freid is the owner and creative director of Think Creative Inc. and the founder of Happiness Counts. He is the also the board president of the Holocaust Memorial Resource and Education Center of Florida. 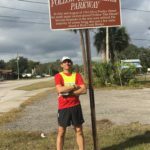 He has been an endurance athlete for over ten years, having completed three Ironman races, multiple marathons, ultramarathons (50K to 50+ miles), a run across the Grand Canyon and, as you've read, a 130-mile run across the state of Florida. "Be brave enough to live creatively. The creative is the place where no one else has ever been. You have to leave the city of your comfort and go into the wilderness of your intuition. You cannot get there by bus, only by hard work, risking and by not quite knowing what you are doing. What you will discover will be wonderful; yourself." WHAT DREAM WILL YOU CHASE?